These jeans were starting to wear very thin in the seat, which incidentally, I totally blame on my cycling to work every day, and I wanted to reinforce the area. There are many ways to create a reinforcement patch, but I decided on the following technique. 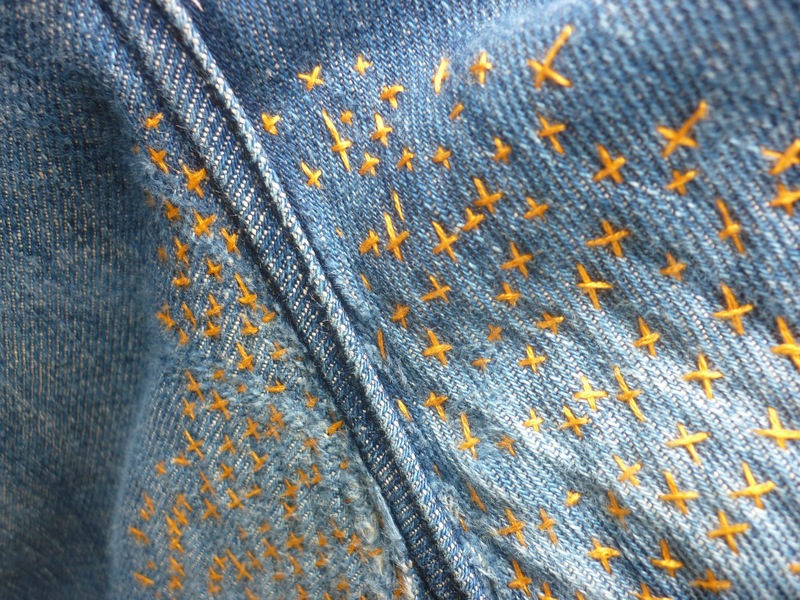 First I basted in place a piece of jeans fabric on the inside. 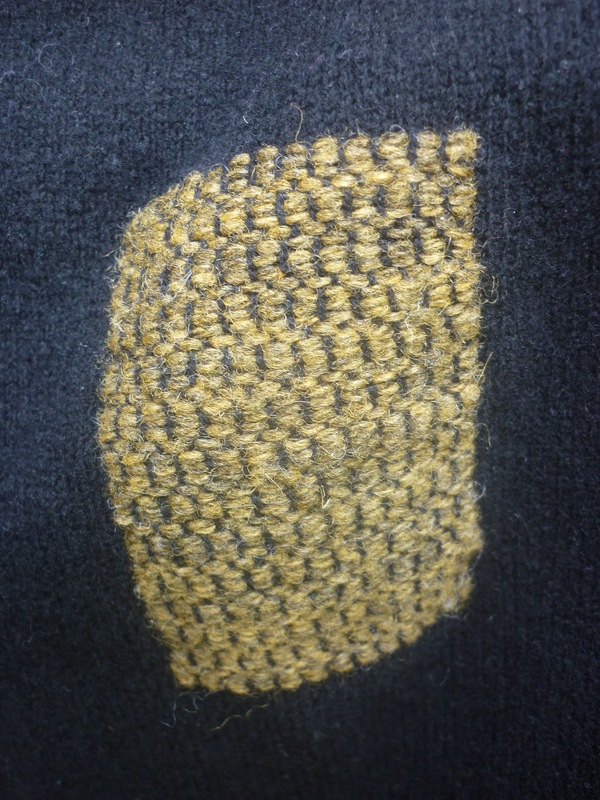 Then I used a lovely shade of golden yellow for a coarsely executed running stitch. I wasn’t too concerned about being neat and precise, as I wanted a slightly random look. I made sure to go through both layers of fabric, to hold the patch in place. Then I went over the whole area again with a running stitch, crossing over the stitches from the first round. As Adrienne said on twitter: “it looks like the sun is shining out of your… ACE!” I’ll refrain from any comments! The elbows in this shop-bought merino cardigan had worn so thin a tiny hole appeared in one of them, so I first had to close the hole. I tidied up any loose threads, then ran some threads of black yarn through the live loops to create a little framework, to be used later. After working out where the fabric required reinforcing, I picked up one side of the “V” of the knit stitches, to run my darning needle across the fabric. I slowly worked my way up, and tried to stick to the herringbone pattern as closely as I could when I came to the hole. In case you are wondering what lovely wool I used for this darn, it may come as no surprise that it is Jamieson’s Shetland Spindrift. This heathered shade gives the patch a tweedy look, which is a nice reversal of the usual tweed jacket with elbow patches in a contrasting material. 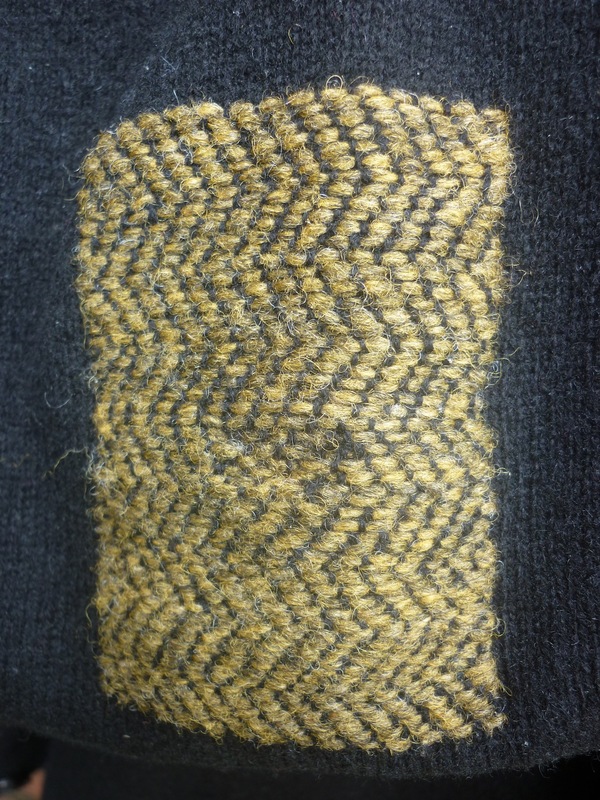 I’m mightly pleased with the results of the pattern darning, and I hope to be able to employ this technique again soon! Inspiring…I have a 19th (or at least very early) woven coverlet, I am determined to try mending it this week. Oh, that’s sounds interesting! I’d love to see some pictures once you’ve done it. Do you have a plan of action? I’ll have to show you a jeans knee mend I worked in a slightly more regimented mock-Shibori fashion. Astonishing how robust these repairs are. I hope yours withstands the rigours of the saddle. Keep us posted. I love the way Shibori looks, I guess it’s the ultimate fabric reinforcement. Or at least the most beautiful! I think you need to arrange an autumnal darning afternoon again. That sounds like a good plan Colleen! Have you done any mending lately? ever since kate davies over at needled turned me on to damask darning, i have longed to see a sample that wasn’t, you know, made 200 years ago by a 12 year old quaker virgin. THANKS!!!! i hope you’ll do a tutorial on it, i’m so excited. on November 1, 2012 at 6:06 pm | Reply Jälle villavember! « Kata .. koob. 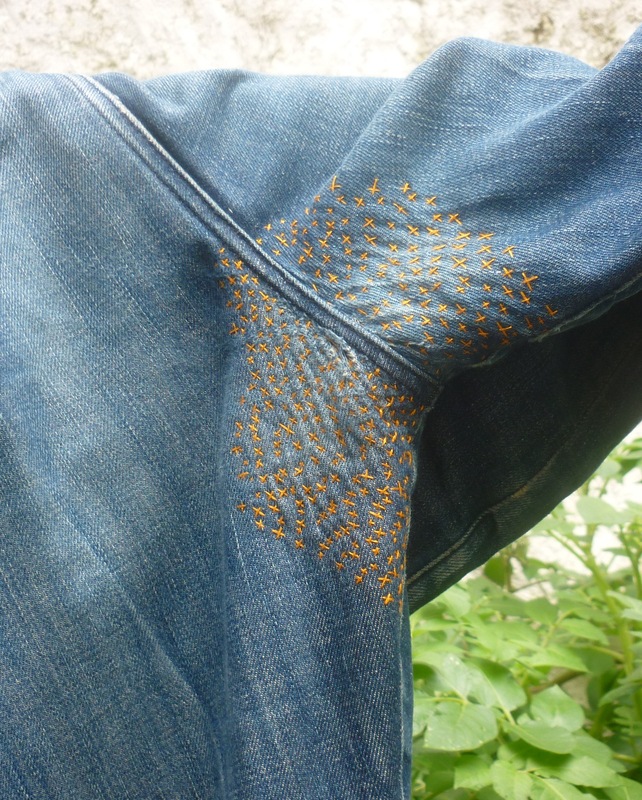 Darning my jeans tonight and did a quick search to see some other examples of darned jeans. You came up right away! Glad to see your patched jeans. I’m using my darning mushroom from PYF! Hope all is well with you. 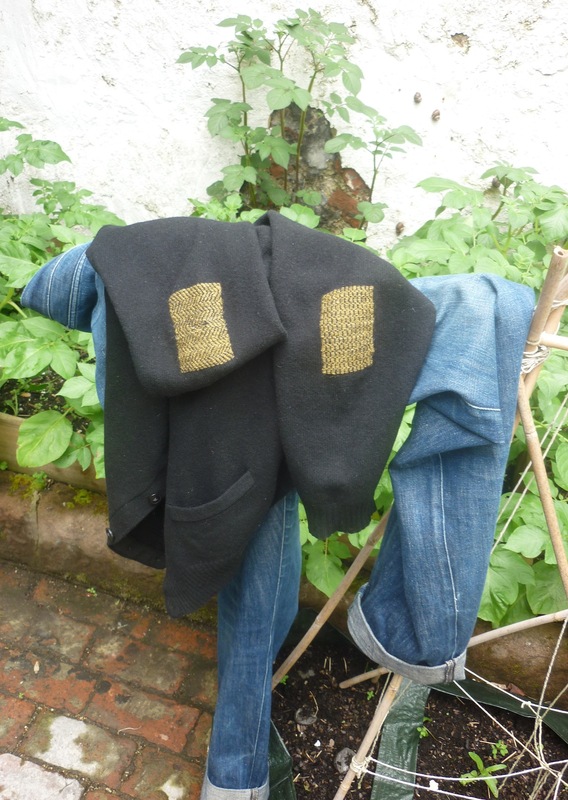 All good here, glad to hear you’re embracing the darning – I’d love to see some pics when it’s finished. How are you? on April 25, 2016 at 9:46 pm | Reply 5 Tips For Making Your Fast Fashion Last - craftivism. You’ve posted a great blog. I liked your post You have used quite a good ideas about patches. By reading your blog, I also feel like making a patch on my jeans. I got a ideas about patches on this blog. Thanks a lot for this beauty Enjoying article with me. I appreciate it very much! You always inspire me to try new things with my clothing.